Congratulations on your first straight. Since it arrived well oiled, I'm hoping that it's been professionally honed and is shave ready, and that you have a good strop. There is a rather steep learning curve with straights, requiring a lot of patience and a good styptic, but the rewards are many. I hope that you enjoy it. Congrats on the new razor.....let us know how it shaves. 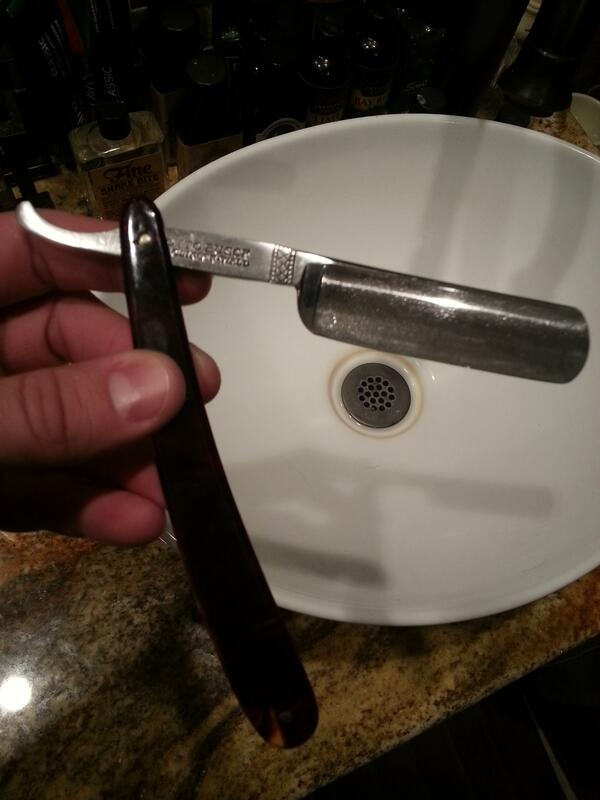 Congrats on picking a fine Solingen razor from a well regarded maker as your first SR. Enjoy. Congrats Cap! Can't wait to get one myself. The razor was honed by a honemaster (Obie) & I also I have an Illinois 127 strop. The first shave went well I think. Cheeks & neck were fairly easy. Only one small nick on the corner of my mouth (too steep of an angle). Definitely not a close first shave but I didn't bleed to death so Im ok with it. I'm not sure how to shave under the nose or the peaks of my jaw bones. I'm a slim guy...6' tall & a "Heavy" 178lbs so my jaw bones & adams apple are pronounced. Congratulations! I'm sure you'll enjoy using it. Many years ago my father gave me a SE. I had it for many a year and eventually lost or gave it away during one of my foreign travels. The only thing I can remember is that it had "Solingen" marked on the blade! Dang! I wish I had held on to that thing. Congratulations for a good razor and a reasonable first shave with it! "Shave the lather not the face" The blade slides along the face with no pressure and the whiskers are removed. (01-03-2015, 03:41 PM)geezer Wrote: Congratulations for a good razor and a reasonable first shave with it! Second shave, no nicks this time. I've got the jaw line & mustache area down now. Concentrating on the angle and the closeness of the shave. Great to here that your first couple of shaves went well. What a great way to start off the new year, congrats! Take your time and expect varied results. It takes about 100 shaves to REALLY get it down and from there, you'll likely have small changes that continue for a while as you map out your face and the best way to attack it. It's VERY different than DE shaves!! The first one is always special, enjoy! Well I had to send my straight off to be re-honed, after only three shaves. I inadvertently ruined the edge with my (awesome) stropping skills or lack there of. The bad thing is I'm really not sure what I did wrong. I've watched numerous how to videos and thought I was doing a decent job. Any & all tips or suggestions are welcomed! did you leave the strop somewhat slack, and/ or apply some pressure ? (01-06-2015, 07:20 PM)Bibbelmann Wrote: did you leave the strop somewhat slack, and/ or apply some pressure ? The strop had what I would consider a very slight amount of slack it it & applied some pressure to the blade. How much pressure on the blade should one use when stropping? Just enough to keep the blade securely flat on the strop. Always keep the spine in contact with the strop and stop your stroke before flipping over to the other side. Many beginners use too great of an angle (more than two spine widths from the face) and this can prematurely dull the blade also. Keep the spine very close to your face (one spine widths if possible) and stretch your skin with the off hand as well as puff out your cheeks as needed to keep the skin flat. Thanks Attila, I was using too much pressure without the spine resting flat when stropping. Hopefully I won't make those mistakes again. captain: Don't feel too bad you are not the only one as I dulled the edge of my first str8 the first time I stopped it (too much pressure) was my problem. Come to think of it using too much pressure was my biggest problem to overcome and that applied to just about everything associated with str8 shaving. I thought stropping was going to be easy for me and it was one of the most challenging skills to learn. I also didn't realize how important proper stropping is to the edge of a str8 razor. I had a very close (three pass) shave tonight. I wouldn't call it bbs but its pretty close. My straight skills have improved dramatically over the last few days. I'm still a bit hesitant each time I strop though. A few more weeks & the amount of time it takes me to use a straight vs. a DE should improve as well.